Google “Sous vide” (French for “under vacuum”) and you will find 10 million search results. It involves cooking food in sealed plastic bags in a water bath at lower (50~70oC) and constant temperatures for long periods of time. This technique was used by French chefs in the 1960s and 70s. It has become increasingly popular at gourmet restaurants because it yields much higher succulence and avoids overcooking. Even Iron Chefs use this technique on TV shows. There is even an expensive water-oven appliance SousVide Supreme for this purpose. Since I have an electric pressure cooker with a “keep warm” function which maintains temperature around 65oC, I decided to try this technique out. Results are pretty good. 1: Clean duck breasts then rub on all ingredients 2. Cover and chill in the fridge for 2 hours. 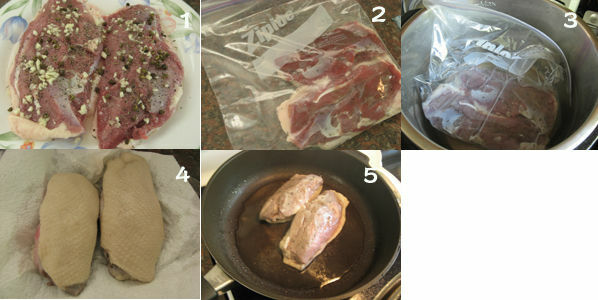 Rinse off spices and place duck breasts in a Ziploc bag, remove air and seal it. 2: Add water in the InstantPot up to 7-cup mark. Leave the lid open, turn on power and press “Keep warm” button. After 20 minutes, place the Ziploc bag in the water bath for 35~40 minutes. 3: Remove the bag from the water and pat dry duck breasts. Sear skin side of duck breasts in a non-stick frying pan with 1 tablespoon vegetable oil at medium-high heat until golden. Turn over and cook for another 20 seconds. 4: Slice the cooked duck breasts and serve with apricot sauce. 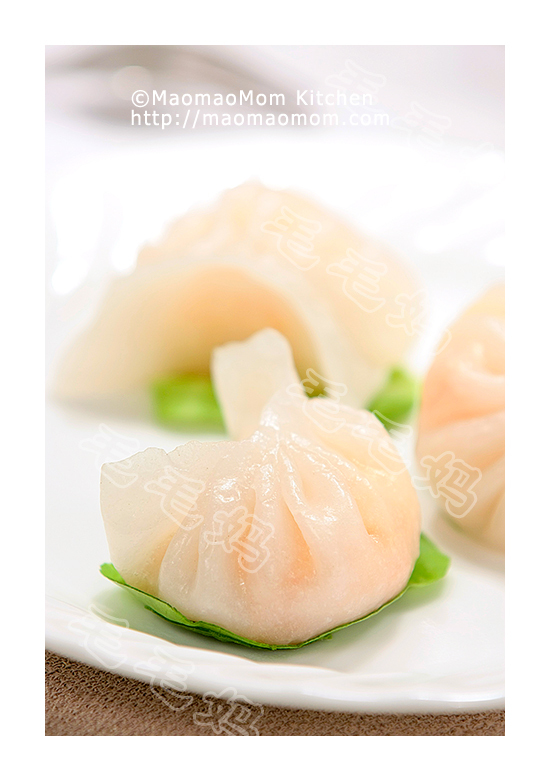 5: Apricot sauce: mix ingredients 4 and 5 in a small pot, bring to boil on high heat then simmer 5 minutes at low heat. This entry was posted in InstantPot pressure cooker, Poultry, 高压锅菜 and tagged Apricot Sauce, Cook Time, Duck Breast, Duck Breasts, Electric Pressure Cooker, French Chefs, Freshly Ground Black Pepper, Google, Gourmet Restaurants, High Heat, Iron Chefs, Long Periods Of Time, Mix Ingredients, Plastic Bags, Salt 2, Skin Side, Succulence, Tablespoon Vegetable Oil, Teaspoon Salt, Water Bath. Bookmark the permalink. MaoMaoMom, what a pleasure it was to discover your website – the nice folks at InstantPot sent me the link to show me your wonderful recipes. I really enjoyed reading this recipe and shared it with all my readers on Facebook, Twitter, etc. I hope to see more of your pressure cooker recipes translated to English – I really like the ones I’ve seen so far. I especially appreciate the step-by-step photos – I know how much work it is to do them with a foggy camera lens!! Thanks a lot for your kind comments. 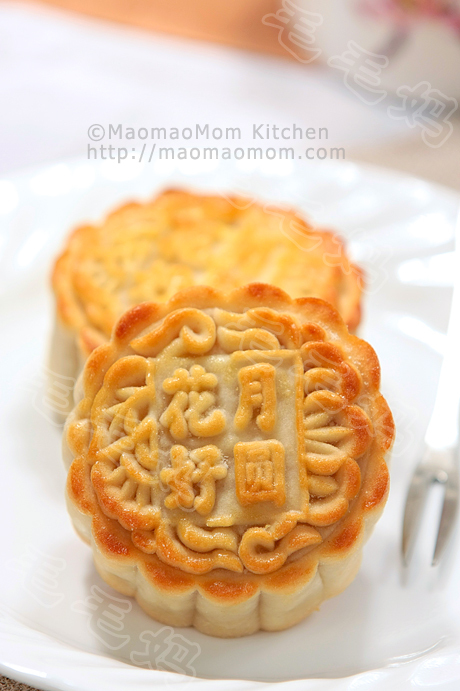 I have added a few more pressure cooker recipes, but without English. When I have time, I will translate them. You can try Google English translation as well. never try sous vide duck breast before , why we try do they ? 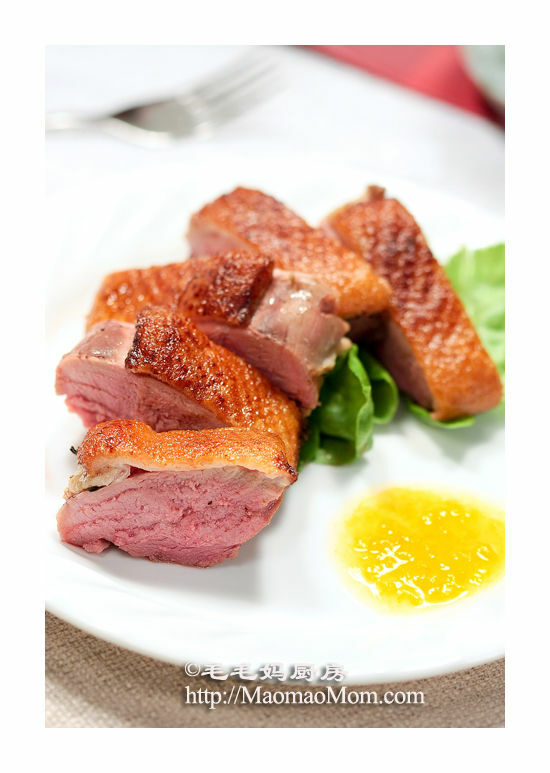 I just tried your sous vide duck breast and it was incredible – thank you for taking the time to do the conversions! Do you have anymore information and recipes using the sous vide method? I would love to do more of this! thank you again! 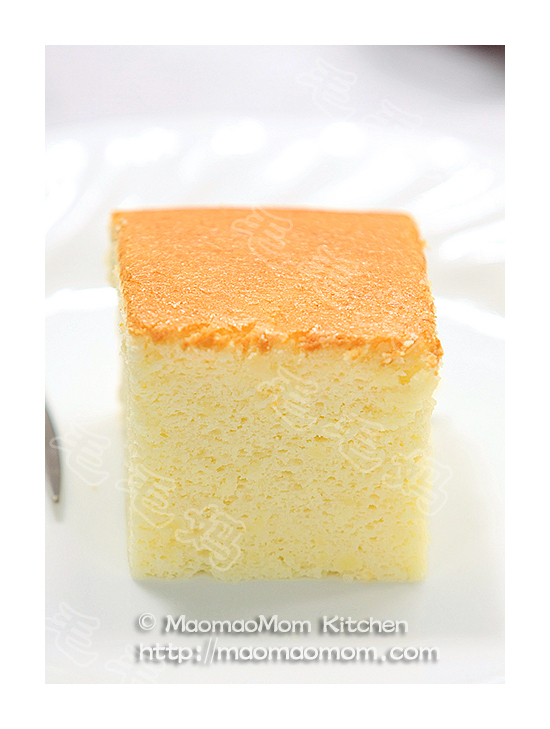 Hello, thank you for providing this recipe and detailed instructions . I’m trying to learn more about cooking with a pressure cooker, and have just learned about the sous vide technique as well. My understanding is that cooking with a pressure cooker would give you results very similar to sous vide, allowing for very tender meat. Have you made this very same dish using the pressure cooker as normal, not using the sous vide technique? I’m curious to know if the pressure cooker version would be just as tasty and tender as the sous vide. I have learned a lot from this website. Thank you so much. Where can I buy the dusk breast? I bought at FarmBoy, you can check out your local stores. This recipe sounds good, but I was looking for a recipe for a peking duck. I just bought a whole duck and wanted to cook in the electric pressure cooker. Have you cooked a whole duck in there or do you suggest cutting it up? Found your recipe via the Instant Pot website. Got myself a food thermometer and decided to give this a try with two medium-sized frozen chicken breasts. I hope a detailed report is okay? I thawed the breasts in the Ziploc bag — closing it up in a Tupperware box filled with hot water that I flipped every 5 minutes for 20 minutes. That gave me time to raise the Instant Pot water to its average Keep Warm temperature of around 70° celsius. I checked this every few minutes, just out of curiosity. I took the Ziploc chicken, added spices in the bag, and rather than sealing it, submerged it open, with a wooden clothes pin keeping it attached to the side of the pot. According to another site, this allows the air to escape while the water bath seals around the submerged filled part of the bag. The posted minimum safe time for sous vide poultry according to another site is 1 hour at no less than 65°, so that what I did. Then, following your suggestions, I took the chicken from the bag, sliced into strips, and seared in hot cooking oil before tossing it atop a salad. The result was moist and flavorful, even though cooked past pink. At least as an experiment of whether sous vide is possible without a new gadget, yep, this convinced me. I’ll now try it with a more expensive cut of meat. wonderful and all the best. I am impressed! Extremely helpful info specifically the last part I care for such information a lot. What’s up, every time i used to check weblog posts here in the early hours in the morning, for the reason that i enjoy to learn more and more. Wow! Finally I got a webpage from where I can genuinely get valuable data concerning my study and knowledge. topics talked about here? I’d really love to be a part of group where I can get advice from other knowledgeable individuals that share the same interest.